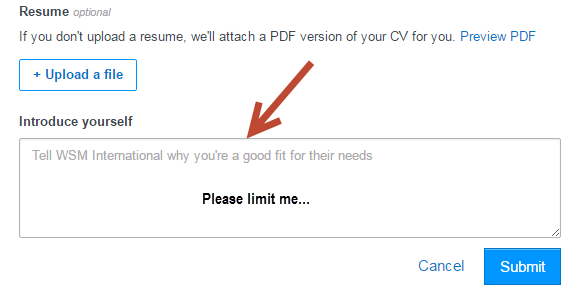 Please limit the "Introduce yourself" textbox when someone applies for a job. A few candidates simply copy cut and paste their resumes into this box. Please limit this box to say 200 words? 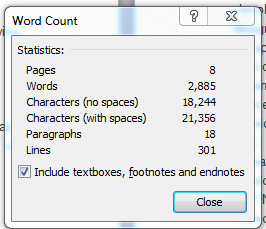 It also spanned 8 pages long. This is way too much information for someone to "introduce" themselves. I think this should be limited to something like 200 words. Otherwise some candidate will feel they must write a long text, while other candidates only write one or two lines. HR then comes along, and decides they like the candidates that put in a lot of effort, or the candidates that kept it short. Unpredictable, so making the process too dependent on lack. A soft-limit might be a better approach. If the cover letter is more than X number of words (maybe an option that can be set by the employer), a dialog is displayed that offers a warning something along the lines of "Your cover letter is quite long. Are you sure you want to submit it?". This way employers expecting detailed cover letters can still receive them, and employers who appreciate succinctness have a better chance of getting it. Is the input field for writing a cover letter in Markdown? If not, why not? How is the “Introduce Yourself” section rendered to the employer?